Today most fitness training programs for older men include weight training. This is because weight training is not just about building muscles and having a lean figure, but also about gaining fitness and strength, as well balance of the body. In addition, building muscles during this senior age is even more important – not only for men, but also for women. This is because; muscles tend to weaken with age, thus taking away your ability to lead a normal, active and healthy lifestyle. However, there are various exercises for senior men that can completely alter the process and help you gain back your strength. Is it okay for older men to lift weights? It has been found out by a study that senior men and women ranging from the age group of 87 to 96 improved their muscle strength by almost 180 percent after just eight weeks of weightlifting. This new strength almost seems to cut back on the age of these elderly people. Thus, fitness workouts for senior men and women, with weights are not only safe, but extremely desirable, as it makes them stronger and more self sufficient. What are the benefits of fitness training programs for older men with weights? It has been found that even frail elderly people gain back huge amount of their strength through weight training. The balance of the body improves substantially, which is usually a huge problem when people grow old. The pace of walking improves and climbing stairs becomes much easier than before. The workout training will not only make you feel younger outside, but also inside. You will feel much more confident and capable. Your new found walking ability will come as a huge boon, as you will no longer have to depend on others to help you, neither will you have to take rest after a few steps. A study carried out on people aged 65 to 79 found out that the seniors could walk almost 40 percent farther without rest after just 12 weeks of weight training. Weak bones become a huge curse when you grow old. But proper weight training can help you to strengthen the bones to some extent. At the same time, it can prevent you from suffering a nasty fall by making you stronger and more agile. Since weight training can build bone mass in the hip and spine, it is especially important for elderly people with the bone-thinning disease osteoporosis. Weight loss is yet another huge beneficial element of fitness workouts for senior men. Weight lifting increases your metabolic rate and thus helps you to decrease body weight and keep you healthy. 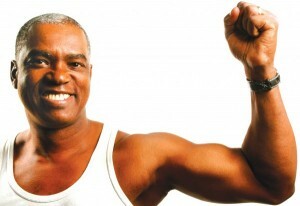 The weight training and fitness training programs for older men also improves the glucose control. If you are affected by Type 2 diabetes, strength training will help you to keep it under control. Before you begin with weight training, check with your doctor to ensure that it is safe for you to undertake the strength training routines. Once your doctor tells you it is okay to begin the training exercises, you can choose the right equipment. Make sure that you do not over-exert yourself. Stop if you feel stressed. Make sure that you warm up before any of your strength training routines. Weight training or strength training routines for older men are a great way to keep healthy and fit – both mentally and physically. So you should include weights in your training exercises as it is a major element in fitness training programs for older men. It’s true. Weight training is not just about building muscles. It’s also about the growing realization that strength training becomes a necessity for the life-embracing senior. Age should never be viewed as an obstacle, as evidenced by some remarkable senior strongmen. For proof, see Clarence Bass (super-fit in his 70s), and “The Biceps From The Bronx”, Marvin Eder (super-strong at 75). The capacity to be inspired – regardless of the candles on your next birthday cake – should never diminish with time, but should grow. Oops. Forgot to add this. The 75 year-old Marvin Eder regularly performs 500 daily crunches, and curls 35 lbs dumbbells. I do much besides the above, just want to keep my limbs strong and my body fit. As I prepare almost all my own foods, keeping track of nutrition is no problem, but I selected a local holistic Dr. to assist me with my plan and analyse blood draw etc. I will add animal fats carefully when I end this plan in February ’14 because I like most of the results, but I think 106# (today) is too light for my 5’0″ form.